He's big, he's soft, he's Activity Dino! 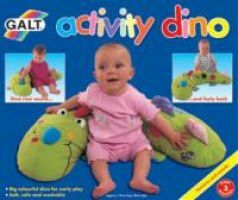 Made with a variety of colors and textures to stimulate your baby's mind, the Activity Dino is also soft enough to be perfectly comfortable to play with or lean against. He even has a fun dinosaur roar in his horn. Makes a great baby gift!